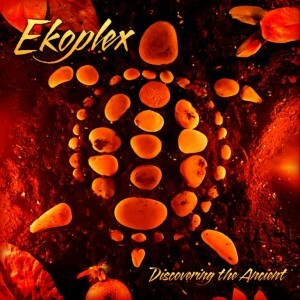 Omnitropic, Ektoplazm’s downtempo imprint, proudly presents Discovering The Ancient, the third studio album by Canadian producer Ekoplex (Ray Vincent). After the success of his previous albums, Journey Of The Turtle and Creatures Of The Forest, Ekoplex now turns inward to explore the cosmic potential of deep tribal trance and downtempo. Featuring live instrumentation, guest vocalists, and experiments in alternate tuning, this is an incredibly vibrant album filled with hidden messages and memorable moments. For greater insight into the creative process behind the music, please consult the extensive liner notes. Mastered by Michael Phillips with original photography by Su MaShakti. MP3 Download | FLAC Download | WAV Download · Download count: 31,974.
thank you for this masterpiece, Ekoplex!) You are my №1 psy trance producer. 5 stars, <3! This time it’s downtempo with the same magical touch inside as the «Creatures of the Forest». Usually I do not like downtempo, but NOT this time! It’s fantastic. Thank you all :) Thanks to Xander (Ektoplazm label owner) for all his help and support. @Alien prime. whats the artist name of your friend? This is truly a Masterpiece that will have a number of replays for me, especially playing at 4a-6a Morning sets. I think this might be the theme I build our annual Spring Burn at around in a couple months. So gorgeous and enveloping, CAN NOT wait to feel the harmonic resonates of the frequencies rolling across the hay fields w/ 15,000 watts of love and firelight licking the shadows playfully! =) Thank you for this gift, truly Ekoplex. Great album!! Listening third time in a row now. Just one question to Ray, is it going to be some unmixed version? Awesome! One of the best downtempo music i’ve ever heard. And thanks for writing some of your thoughts in the liner notes, they’re really interesting. I have to hear it again now..
@inforest and anyone else wandering. Yes Im going to put out versions of the tracks unmixed fo DJs if they wish. Either I will put them on my soundcloud as a free download or if Xander wants to host them here. thanks Ray for such good news. Always waiting for more music from you. Ray thanks for this amazing release!!! went to sleep with this one in the last two days a real journy full of intresting and original sounds and ideas! Thank you for keeping music alive waiting for more releases from you! Perfect, stunning work as all the previous! Ray Vincent is the master of magicians! Thank you for a most pleasant surprise. Normally I find downtempo too boring to keep my mind interested… but this is totally different. Well, I knew from previous Ekoplex releases it would be good, but this exceeded my expectations. Warm, beautiful sounds with awesome sounding bass. Superb album, best psybient i’ve heard in a long time. bliss be with you 20 years ive waited for trance tuned corectly we must now sort this across the scene and in higher tempo i know how to open gates with it eclipse october this year more! more! more! This is such a great album. Really cool tempo throughout. Very tribal. Excellent Job! Such a surprise to me too. I loved the tunes you made before, but this album is high above … thanks! Absolutely amazing album! =D Deep, trippy and groovy! Well done and thanx alot for sharing this masterpiece! Wow thanks everyone, it always makes it that much more worth it to know you’ve made a connection with your music. Im going to have a little CD release party here in Toronto, sorry for those too far away :) It going to be on the 25th of February. Visionary. Ekoplex has reached a new plateau! This one I had to download on WAV; it was that good. The MP3 version just didn’t do it justice in my opinion. It’s hands down my favorite album of 2012. I think I felt my brain ripple during the Shapeshifter tack! Outstanding! Ray’s music has evolved by leaps and bounds. This one is downright amazing. Ray, you just set the bar a little higher once again. Thank you! wonderful music!! thanks for sharing!! I love this album. Listening to it a lot when learning for university, or just relaxing! I especially like the update of “Aya”, that track was on one of the previous albums but I love this version! This is a gem, a great travel. I feel the life is much is easier than before. This music helps me in the positiv thinking and i can forget the everyday problems. I listen Ekoplex whenever i can. I suggest Ekoplex without risks and side effects for everybody. Thanks Ektoplazm! It made last Saturday absolutely purrfect! ekoplex, you makes me happy, i was waiting for a new release for long time, and this one is definitely a surprise, i love donwtempo music, and you did it great !! greetings from france and keep the positive vibe !! Thankyou! :D beatiful happy energies emerging from within and without, arriving and landing peacefully, in the sametime expanding to unknown destinations with an oopmf of power making me wiggle all over. Thankyou! What a killer downtempo album! one of the most shamanistic album on ektoplazm :) love it. Thank you everyone for the amazing feedback. I love hearing what feeling and visions the music invokes. Check out my soundcloud if you wish to download unmixed versions. Fantastic. Thanks for the music. i really love your thoughts about your album and especially the mood youve created, its so very natural (thanx to tunings) and full of tense and imagery of your soul and heart, i appreciate its not a style but music, 5 stars for a special artist with special visions (not often seen, always nice to find) i had a really nice walk through town with your music on headphones, much pleasure and very good feelings about it !!! Thanx for this one, a must have! Fantastic journey! I need moar! MOARRRRRRRR! The MP3 link seems to be broken. Get the following error : MP3.zip isnt archive or archive is corrupt. archive signature not found at end of archive. Please recover it reusing ‘r’ command or use -tp- option to ignore recovery record. Has some new album coming out? It’s been a long time since you do not release new sounds. We’re needing! Absolutely love your music mate. Trance Danced for the first time in years tonight! Still in love with this album and still dropping tracks from it at gigs. Good tunes never get old. Did you ever happen to host the unmixed tracks anywhere? Much love from the West Coast! This album is absolutely incredible! Shamanic Drumz is pure vision. Pure joy. Thank you! I love this album!, any way to get the dj versions? Thanks. I found my roots along my tracks. There was never music that resonated that much with me and my soul. I am so thankful for this gift. Bless you. Love and peace. It’s like I’m coming from future.